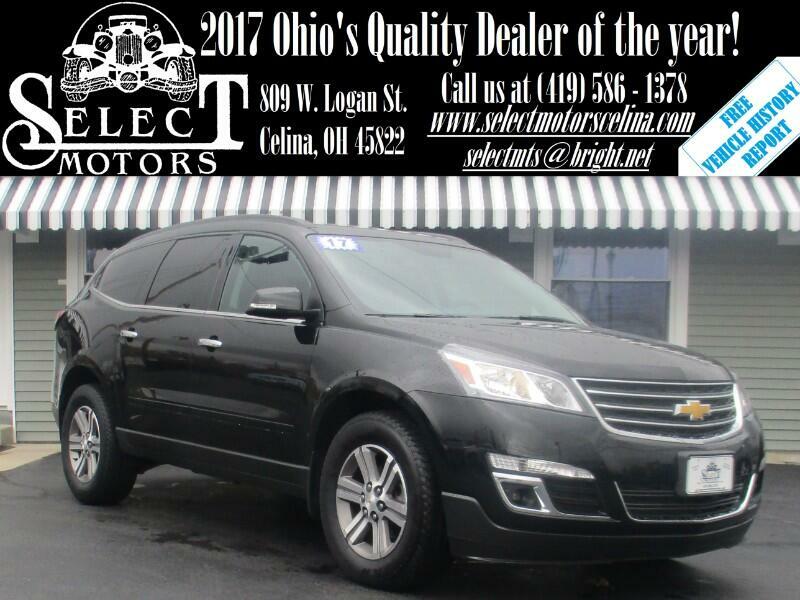 ***TXT US @: (419) 362 - 6200*** AWD, 2LT, Captain chairs, heated cloth, power lift gate, backup camera/sensors, automatic headlights, fog lights, automatic dimming mirror, home link, heated/signal mirrors, dual automatic climate control, power windows/locks/mirrors, keyless entry with remote start, AM/FM, SiriusXM, auxiliary and USB port, steering wheel mounted audio controls, Bluetooth, power seat with power lumbar, tilt and telescopic steering wheel, cruise control, information center, 18" alloy wheels. Fuel Economy: 16 city / 24 hwy. Warranties: Balance of Chevy's 3 year or 36,000 mile bumper to bumper and 5 year or 60,000 mile powertrain coverage. In service date: 01/27/2017. Extended service contracts available. The 2017 Chevrolet Traverse is a crossover SUV with seating for seven or eight passengers, depending on the second-row seating configuration. There are essentially three main trim levels: LS, LT and Premier. However, the LS is further divided into Base (1SM) and LS, and the LT is subdivided into 1LT and 2LT variants. Standard features on the entry-level LS Base (1SM) include 17-inch steel wheels, automatic headlights, roof rails, a rear spoiler, front and rear air-conditioning, 60/40-split folding second- and third-row seats, a tilt-and-telescoping steering wheel, cruise control, Bluetooth phone connectivity, the OnStar telematics system (with 4G LTE and Wi-Fi hot spot), a rearview camera, a 6.5-inch touchscreen display and a six-speaker sound system with a CD player, an auxiliary audio input jack, a USB audio interface and two additional USB charge-only ports. The Base LS model is offered only with front-wheel drive. The LS (1LS) model adds satellite radio. All-wheel drive and other extra-cost options not offered on the 1SM are available on the 1LS. Stepping up to the 1LT trim adds 18-inch alloy wheels, foglights, heated mirrors, rear parking sensors, remote start, an occupant-protection airbag mounted between the front seats, an eight-way power driver seat (with two-way power lumbar) and a leather-wrapped steering wheel. The Traverse 2LT includes all of the above, plus an auto-dimming rearview mirror, a power liftgate, tri-zone automatic climate control, heated front seats, second-row captain's chairs (the second-row bench seat is still available as an option), and rear-seat audio controls and headphone jacks. You also get the MyLink infotainment interface, which includes Bluetooth audio connectivity, voice controls, internet radio app integration and a 10-speaker Bose audio system. A Graphite Edition package equips the 2LT with 20-inch wheels, special exterior trim and a navigation system.